This weekend I was lucky enough to attend my fourth New England Society for Children’s Book Writers and Illustrators AKA NESCBWI (worst acronym ever) Conference and it was a doozy. The keynotes speakers were Jane Yolen and Tomie DePaola, both known mostly for their work in pictu re books, but Jane Yolen has a few novels in her 200 publications. My favorite presentation was given by Mark Peter Hughes, the author of Lemonade Mouth, which is now a Disney Channel movie. A hit one at that. Truth is, probably more kids have seen that movie than Prom, which was the movie Disney released a few weeks ago (and Renata blogged about). My friend Shoshana (Hi Shoshana! Check out her blog here) works at a bookstore and said copies have been flying off the shelf. 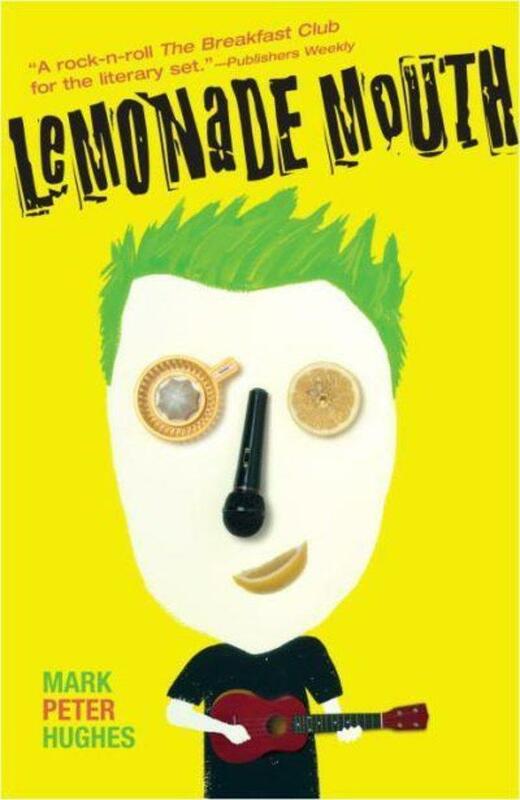 I read Lemonade Mouth three years ago, when I attended my first Whispering Pines Retreat and MPH (Not NPH, but just as cute and funny) was the mentor. He is a Rhode Islander like me, and sets his novels in my home state. 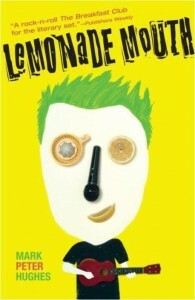 I was so happy when I heard that Lemonade Mouth was becoming a movie, because I knew how big that this was. It is fantastic to see a local guy get success like this. Anyway, I digress. His workshop was entitle Help! Help! I’m Stuck! and while I’m bound by the oath of NESCBWI to not discuss the details on my blog, let me say that I’m excited to continue writing my novel. Just seeing him there so excited to talk about the craft we both share and know that he is turning non-readers into readers at this very moment is exciting. The theme of the conference was something about Milestones because it was the 25th year and there was a lot of talking about the success stories that have come from SCBWI and it gave me some hope and goals. For now, though, I’m just going to plug along on my novel and read my YA novels and dream that someday I’ll be standing in front of a room of pre-published writers with a story to tell. I discussed in my first post about finding that Judy Blume novel on my sister’s shelf made me a reader, but it was another tattered book that I read that made me obsessed. That one was S.E. Hinton’s 1967 novel (one of, if not the first “YA” ever) The Outsiders. 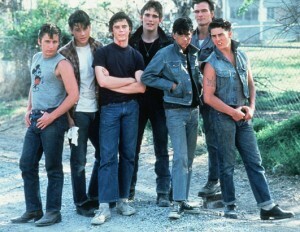 The cute Greasers of The Outsiders. Check out Tom Cruise's original teeth! Now, I’ll be honest. I don’t remember if I saw the movie first or read the book first. I know one happened quickly after the other. And let’s face it, there were a lot of cute guys in that movie. (left to right in the photo, Emilio Estevez, Rob Lowe, C. Thomas Howell, Matt Dillon, Ralph Macchio, Patrick Swayze, and Tom Cruise . It was the Twilight of the 80s, they even line up and stand around waiting for a big fight at the end of the movie. I do know that I forced every one of my friends to watch the movie with me and/or read the book. By the time we read it in 7th grade Reading, most of the girls in my class had read/analyzed and obsessed over it. My 12-year old niece broke my heart when she told me she had to read the novel in her 7th grade class and she hated it. She said it was boring. I don’t know, maybe it doesn’t hold up, it is over forty years old now. Do teenagers have the same intense feelings they had in the late 60s? Would Ponyboy be able to exist today in an age of cell phones and the internet? The whole essence of the novel is the strong relationship between the Curtis brothers and their friends. Their parents were killed, so they make their own family. When Pony runs away after his oldest brother hits him, a cell phone would have solved the conflict instantly- there would be no story at all. The is a reason The Outsiders has a special place in my heart. My friend and I would write stories about the characters (usually making ourselves their girlfriends, but what can you do). I wrote more back story for the other boys in the gang that as readers we only get glimpses of. It was fan fiction at its most pure, because it was before I knew such a word existed and the only people I was writing for was my friend and myself. It, however, sent me on a lifelong path of writing primarily adolescent boy characters and being interested in the “bromance” between guys. I love watching males bond and become friends and I love writing about that. I think The Outsiders has a big part of that.